The occurrence of the Spring Hill Mine Disaster of 1958 brought about much attention from onlookers, as well as reporters through local and global sources of media. According to Rosenberg, Virginia Bluegrass singer Bill Clifton was personally touched by a remark made by Ruddick when his rescuers’ reached him. Clifton made a quick phone call to Ruddick, who was in the Springhill Miners Hospital, asking him if he would write his story. Before the closing of 24 hours, Clifton received a poem from Ruddick. It’s been hit by explosions, fires and bumps, everyone’s heard of Springhill’s name. We rode way down to our shaft underground, to earn our daily bread. That day on October 23rd at 8 o’clock, Springhill rocked. While rescuers toiled in vain to aid us miners wracked in pain. Thanks to the aid of old friends and new. Many are the thanks we extend to all, in answer to our Saviour’s call. With permission, Clifton expanded the poem with local friends and musicians, Paul Clayton and Sonny Pembroke. Within a few hours they were able to create a six-verse ballad while maintaining Ruddick’s central theme as well as well as his phrase which first inspired Clifton: “Give me some water and I’ll sing you a song.” According to Rosenberg, Clifton and one member of his band, Dixie Mountain Boys, recorded The Springhill Mine Disaster in Nashville on November 5, the day before the last body was removed from the Springhill Mine. It was immediately released in both Canada and the United States and received extensive airplay on Halifax radio as well as on the “Western Airs” hit parade at CHNS. Ruddick also appeared on The Ed Sullivan Show although it is not known if this song was performed. Ruddick is listed as a co-author of the song and donated his share of the royalties to a fund for the families of the men lost in the disaster. Source: Rosenberg, Neil V. 2000. The Springhill Mine Disaster Songs: Class, Memory, and Persistence in Canadian Folksong. In Northeast Folklore: Essays in Honor of Edward D. Ives, ed. Pauleena MacDougall and David Taylor, 153-87. Orono, ME: University of Maine Press & Maine Folklife Center. Down the shaft underground in our usual way. And the black hell closed ’round us ’way down in the ground. The rescue work started; their hopes were still high. In that dark, black hole in the ground. Only God will ever know all that happened down there. After days of cruel torture we’d no hopes to be saved. We sang altogether, though racked through with pain. When they broke through we knew that our prayers weren’t in vain. I crawled through the tunnel, they helped me along. And the others who stayed there forever to sleep. And pray for your friends who have gone on ahead. And that dark, black hole in the ground! Maurice Ruddick, a 46 year-old African Canadian, was one of the seven last miners to be found alive after the October 23, 1958 “bump” collapse at No. 2 Colliery of the Cumberland mines in Springhill, Nova Scotia. Well-known for the creation of his own songs, Ruddick was a performer with a local quartet. He was known throughout the mine as an entertainer among the miners during their rest periods and trips in the trolleys. Ruddick was able to establish a sense of spirit and prayer among his fellow miners and surrounding community through his compositions and love for songs. 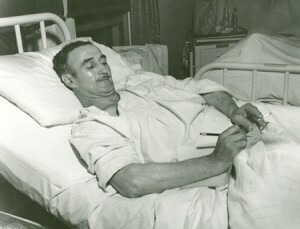 Ruddick, though struggling with a broken leg from the collapsed mineshaft, strove to maintain his companions’ courage by leading them in varieties of song and prayer while waiting for rescue. While trapped in the mine, Ruddick began composing “Springhill Disaster” while thinking of the quartet and of the possibility of marketing the song for publication and broadcast. Lerner, Leonard. 1960. Miracle at Springhill. New York: Holt. Rosenberg, Neil V. 2000. The Springhill Mine Disaster Songs: Class, Memory, and Persistence in Canadian Folksong. InNortheast Folklore: Essays in Honor of Edward D. Ives, ed. Pauleena MacDougall and David Taylor, 153-87. Orono, ME: University of Maine Press & Maine Folklife Center. Rosenberg, Neil V. 1991. Maurice Ruddick: In Memory. Canadian Folk Music Bulletin 25/1: 12-14.